For serious athletes and adventurers who want to do more, not wear more — fenix 5S is the perfect fit. It’s our premium multisport watch that offers full-size performance in a lighter, sleeker, more compact design. So you can beat yesterday with advanced features such as wrist-based heart rate, built-in activity profiles, navigation functions, and performance metrics that measure the effectiveness of your workout. It’s one smart sport watch you can comfortably wear anywhere — office or outback — to keep pace with your active lifestyle. Premium smaller-sized (42mm) multisport GPS watch with Elevate wrist heart rate technology. Put key stats at your fingertips with the performance widget that shows your training status, training load and more. 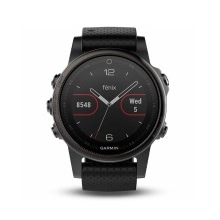 Connected features include smart notifications, automatic uploads to Garmin Connect online fitness community and personalization through free watch faces and apps from our Connect IQ store.